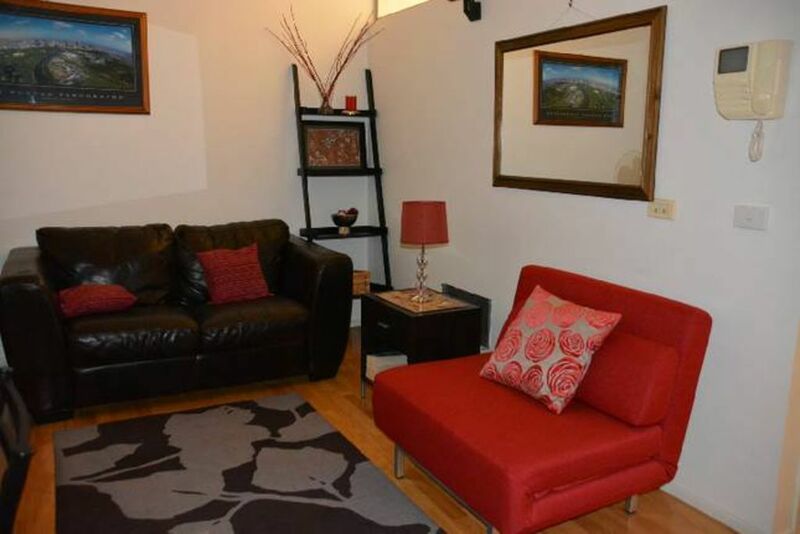 This is is a fully self-contained 1 bedroom unit with separate living/dining/kitchen area. It accommodates 2 guests comfortably. There is also a single sofa bed in the living room suitable for a child or petit adult. It is tastefully decorated and furnished for a comfortable stay. *Check with owner for car park availability, charge applies*. Bond: On arrival, sign credit card pre-authorisation for any loss or damages. The bedroom comprises a queen bed, bedside table and lamp and ample storage in built in wardrobe. Linen and towels are provided. This is separate from the living room. The kitchen with its beautiful timber cabinets is well equipped with s/s Blanco cooking appliances, dishwasher, microwave, pots, pans, cutlery, crockery, utensils, tea, coffee, sugar and other pantry staples. The separate open plan living and dining area with dining setting, an LCD TV, DVD player and a study nook. Curl up and read a book or watch TV on the comfy chocolate leather sofa. The bathroom is complete with towels, complimentary soap and shampoo. The washing machine and dryer are nicely concealed behind a cupboard. A small amount of washing powder is also supplied at no cost. The unit has heating and a split system air conditioner, secure video intercom system, lift and stair access. An IGA Express supermarket is only 1 min walk away. It is the perfect base for your stay, whether getting around on foot or jumping on the FREE tram at your doorstep. Many top quality restaurants including Coda, Lucy Liu, Movida, Chin Chin, Pastuso, French Brasserie and Press Club are 1-2 min walk away. Cafes, bars and clubs 1-2 min walk. Nice suite in the centre of town. This apartment is perfect for a stay in Melbourne. It is small, but the space is designed for maximum usability. The apartment is quiet, clean and comfortable, with windows that face an office building. This worked well for me as I was gone during the day and had privacy when I returned in the evening. The apartment's location is excellent. It is within Melbourne's CBD, across the street from Federation Square. A number of trams that go throughout the city stop just outside the building's front door. In addition, this apartment is within walking distance to many Melbourne sites, including the Immigration Museum, Flinders St Station, the Melbourne Aquarium, and Fitzroy Gardens. The apartment's owner was a pleasure to work with: responsive and knowledgeable. If ever in Melbourne, I would happily rent this apartment again. Really great place. Close to everything, comfortable and loved the personal welcoming touches. It is not only important to us that our guests feel at home and happy during their stay, but that they leave knowing they will always receive genuine hospitality when they return. Your review is greatly appreciated. Thank you very much for your review. It is really satisfying to know that our guests are very pleased and appreciate the effort we put into our service. We stayed for 4 nights in Melbourne and found the location incredibly convenient. Its an 18 - 20 minute walk to the MCG and a short 3 - 5 minute walk to the Flinders Street station. There were plenty of cafes & restaurants within 1 - 5 minutes walk. The apartment itself is clean and had everything we needed and given the location is pretty central and busy it was pretty quiet and 'noise free'. Maria was a very friendly and helpful host, the bread, milk and other basic necessities provided were appreciated. Would definitely recommend to other travelers and would stay again. Thank you for hosting us Maria. Thank you for your positive review. Yes, the unit is indeed in an excellent part of the city which is hard to beat. It makes me very happy that you enjoyed your stay. Looking forward to having you back!